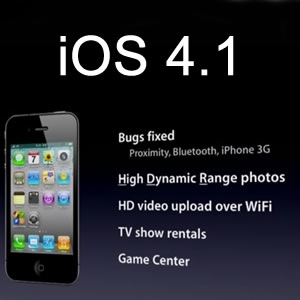 Apple’s UK announced that the iOS 4.1 software update will become available starting this Wednesday, on 8 September. And these are really some good news, because we started to hate that “coming soon” message. And this isn’t the only thing it’s gonna take place on 8 September, also, the new iPod Touch will become available. So, what this update has to bring? Well some new enhancements are expected, like the Game Center that enables multiplayer gaming for iPhone and iPod Touch users and offers APIs auto-matching opponents and tracking achievements for developers. iOS 4.1 update also brings TV show rentals, HDR photography support and HD video uploads. With the refined AVRCP support and Bluetooth you will be able to control the audio via wireless. Excessive slowdown is eliminated with this new update for iPhone 3G users and the iPhone 4 users should see some improvements and corrections to the sensitive proximity sensor. The iOS 4.1 software update will be available for iPhone and iPod and the iPad will have to wait a little longer, until November to enjoy the iOS 4.2 update.